As I had promised I am back again friends. I missed all of you and I hope you say the same about me. It will take me some time to visit all of you again and read about all that you have done, but I will definitely do so. Any way Summer has set in and summer’s synonym is Mango. One delicious fruit, botanically a drupe but can be used differently to make many delicious dishes both from the raw fruit and from the ripe one. Now looks like I am going to end up blogging a lot of raw mango recipes now as I am using them quite a bit. 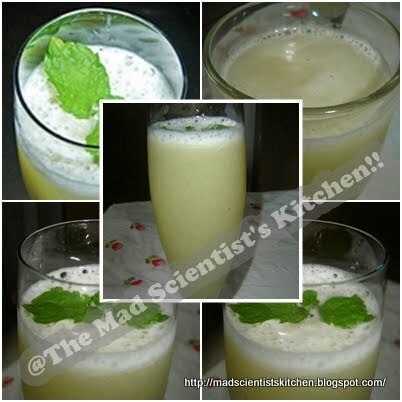 The drink from raw or half raw mangoes is a delight and not only is it cooling but also healthy. So go ahead and make this and drink it in gallons. There are no fixed proportions for making this drink the amount of sweetener you will require will depend on the sourness of the raw mango and of course you. 1. I prefer to peel the raw mango before boiling it with a little water in the cooker. 2. Two whistles and put off the gas after the steam escapes let the mango cool. 3. Next remove the pulp of the fruit discarding the seed. 4. Transfer it to the mixer and with any sweetener (I prefer jaggery) grind it. 5. Adjust the taste remember you are going to dilute it with water so to has to be sweet but sour. 6. Add green cardamom powder, salt. You can add jeera/cumin seeds/jeerigi powder if you wish. In summer such drink is very refreshing. Great preparation. Very tangy drink! It looks refreshing! My most fav summer drink! Very tempting and refreshing drink, feel like having rite now even its cold here..
Oh, we love this..it looks so refreshing and great..perfect drink for summer.. Thanks all. Glad to know I am not forgotten. so refreshing and tangy drink !! wow. i can guess how tasty it will be. Indeed we missed you, good to have you back. This drink is new to me, it looks refreshing.